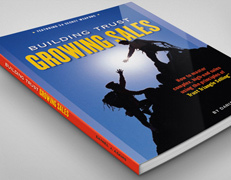 What is Trust Triangle Selling? My sales manager loomed over me. This was no small feat for Sam, given that he was six inches shorter than I was. Somehow he always managed to seem taller. Sam was potbellied and had a bad back that made him waddle when he walked. Still, he managed to intimidate me, a twenty-two-year-old fresh out of grad school. He shook his head in exasperation and bewilderment. Four months into my yearlong training program at General Electric Healthcare, I was making every mistake in the book. The day before, out of frustration over his teaching philosophy, I had kicked a trash can across the room, making everyone in the office jump and sending debris clattering across the floor. I went home that day feeling worthless. A total failure. I was a guy with an MBA, some selling experience, the right attitude (or so I thought), and a willingness to learn. Still, I could not figure it out. It was humiliating. My previous mentors — my mom and dad, Bob and Alice Adams, and my basketball coach, Verne Luebstorf — had been kind, encouraging my self-confidence and building me up. Sam O’Rear’s goal seemed to be to tear me down. “He’s turning you into an abused dog,” my wife said. Mary didn’t like Sam’s penetrating gaze or the way he wouldn’t let go of her hand the first time they shook. She didn’t understand why I admired him and wanted to please him so much. It was because Sam knew his stuff, I told her. He knew exactly how to conduct himself with customers and employees. 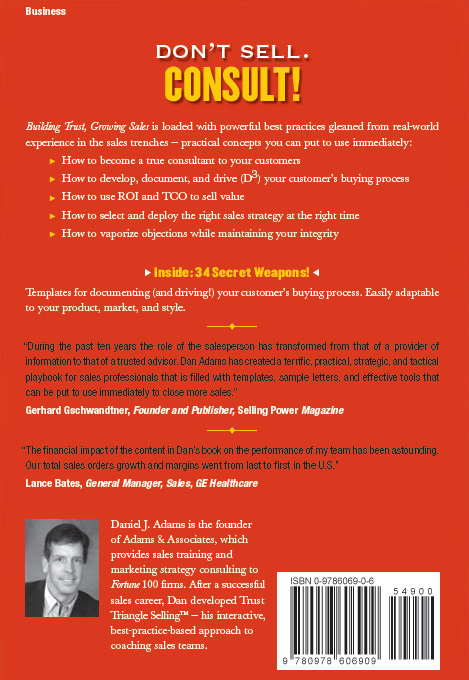 I was convinced that he knew what it took to become a sales superstar. Despite my discomfort, I saw that his harshness was a means to an end. He was trying to motivate me to work harder to absorb his teachings. He wanted me to succeed, not fail. So I decided to hang in. I wouldn’t give up. Making mistakes was inevitable, I reasoned — but repeating them didn’t need to be. I gave myself permission to make every kind of mistake possible — but only once. When I showed up the next day, Sam’s attitude had shifted. He flashed a big toothy grin; he knew he had me. It got much better after that. A dozen years later, in recognition of outstanding achievement, I was setting records for the highest number of nominations to GE’s President’s Club for sales success. I listened to Sam. I wrote things down. I paid attention to my higher-achieving colleagues. I analyzed what worked and what didn’t. I created tools and shortcuts — my secret weapons — and gradually developed the methodology presented in this book. presented in this book. By the time I left GE, my skill set and personality profile had been evaluated along with other superstars and had become the model for new GE hires. In a test measuring these traits (some of which we’ll discuss in chapter 1), I achieved the highest score ever. After GE I moved on to marketing and sales positions at Cisco Systems and then to Ariba, Inc. In September 2001, together with the rest of the world, Mary and I watched in horror at the events unfolding on our TV screen. Life suddenly felt very short. I realized that after pushing so hard for twenty-two years, I had finally accomplished everything I had wanted to accomplish. It was time to pull the plug. We decided to sell some of our stock and other holdings. Mary and I hovered over the speaker-phone on the call to Charles Schwab. We were shocked at the blasé attitude of the clerk who obeyed our order to sell. In a bored voice he recited the resulting seven-figure deposit to our account. I tell you my story not to boast — though I am proud of my accomplishments. I share it because I believe that you, too, can achieve superstar status in your industry — without making all the mistakes I did. By following this methodology and using these tools, you can strengthen your selling skills and create long-term relationships with your customers while maintaining your credibility and integrity. It’s a win-win equation: you win with your customers — not at their expense. Consultative and strategic selling principles and integrates three processes: the Customer Decision Process (chapter 2), the Customer Buying Process (chapter 3), and the Superstar Selling Process (chapter 4). I admire Sam’s business skills and sales expertise, and I’m grateful for his generosity and wisdom. I still take issue, though, with some of his teaching methods. I have a lot of empathy for sales reps who are now experiencing the discomfort I went through before I finally got it. I’m committed to showing you the shortcuts — the most effective way to get from A to Z. (Why bother with the long route?) I offer this gathering of best practices as an easier, kinder way to learn — one that will save you time and spare you pain. Sam and my other mentors would call this “paying it forward” — offering a hand up to the next generation of sales professionals.